Columbus, Ohio. In this seven session video series Powell invites you to explore seven important questions about Lutherans and the Bible. He does not prescribe “the Lutheran way" to read the Bible nor does he dismiss the way you may have come to understand the Bible. 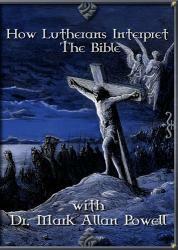 Instead Powell presents a variety of Lutheran perspectives for interpreting the Bible. Through Powell's rich discussions you will discover answers to questions you have always had about the Bible. Included with the DVDs are a CDROM of a robust study guide and additional support material. The study guide offers 3 suggested formats for use: 60 minute adult study; 90 minute adult study; and 30-45 minute Committee Starters for Congregational Leadership. Missing the study guide? Click here to download the study material. How Lutherans Interpret the Bible from Select Learning on Vimeo.